STATE LOSES BIG IN FED SHUTDOWN: As a partial shutdown of the federal government continues, the state of Maryland could soon be missing out on tax collections, reports Pamela Wood for the Sun. Democratic Comptroller Peter Franchot’s office estimated Monday that 172,000 Marylanders are affected by the shutdown, including federal employees and contractors who aren’t being paid. Comptroller Peter Franchot estimates that the 172,000 federal workers in the state have lost a combined $778 million every two weeks. That results in about $57.5 million less in tax withholding and another $2.1 million in estimated lower sales taxes, Bryan Sears of the Daily Record reports. 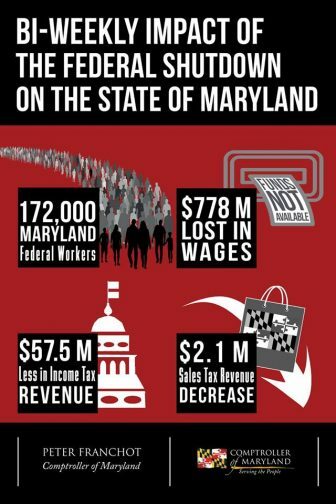 Holden Wilen of the Baltimore Business Journal writes that Maryland has so far lost $60 million in tax revenue as a result of the longest federal government shutdown in history, according to a report released Monday by the state Comptroller’s Office. At 10 o’clock in the morning, Austin Lanham should be working at NASA’s Goddard Space Flight Center routing satellite communication. But with the partial federal government shutdown, he’s not working and the preschool his two sons go to is shut down because it’s on NASA’s property. That’s the case with many federal child care centers in the Washington D.C. region and with some around the country, Mary Rose Madden reports for WYPR-FM. PUSH FOR $15: Advocates and lawmakers began their push Monday to gradually raise Maryland’s minimum wage to $15 by 2023, a starting point for negotiations on what’s expected to be one of the hottest topics of this year’s General Assembly session, reports Pamela Wood in the Sun. The state’s minimum wage is currently $10.10 per hour. TECH COUNCIL PICKS ANNAPOLIS BATTLES: The Maryland Tech Council is ready to stand behind bills that support the innovation economy this legislative session, and oppose those that might make it harder for drug companies to do business, Morgan Eichensehr of the Baltimore Business Journal reports. The organization, which represents over 450 life sciences and technology companies in the state, closely monitors the activities of the Maryland General Assembly each year and advocates on behalf of its members’ interests. MILLER TAPS PINSKY TO LEAD EHE: For all their philosophical differences, state Senate President Mike Miller Jr. (D-Calvert) and Sen. Paul Pinsky (D-Prince George’s) do agree on one thing: There was a time, not that long ago, when Miller would have been highly unlikely to tap Pinsky to chair a key committee. For nearly a quarter century, the Prince Georgian has served as a member of the Education, Health and Environmental Affairs Committee without ever getting the chance to lead it. Bruce DePuyt writes in Maryland Matters. GERRYMANDERING PUBLIC MEETING: Several Frederick County residents and other voters voiced their opinions about Maryland’s 6th Congressional District on Monday night. The Emergency Commission on Sixth Congressional District Gerrymandering hosted a meeting where they heard recurring themes from those residents: fairness, and using computer algorithms to redraw the new district. The redrawing of the 6th District will also change the state’s 8th District and perhaps others, Steve Bohnel of the Frederick News-Post reports. ‘I’M ALIVE’ APP BILL REVIVED: Arelis Hernandez of the Post writes about Del. Mike McKay’s bill proposal for a mobile app to help social-service officials verify if parents with a history of drug addiction can safely care for their newborns. The “I’m Alive Today” app send them automated prompts asking, “Are you able to care for your child?” If the parent doesn’t respond affirmatively, the app alerts the case manager to check in. HOW OPPORTUNITY ZONES WORK: There are chances to lure development to some long-ignored areas of Baltimore and other parts of the state that have newly created Opportunity Zones, but the money won’t automatically flow, a panel of experts told a crowd of businesspeople Monday, Meredith Cohn of the Sun writes. Opportunity Zones were created under the massive federal tax law signed in 2017 and are designed to direct investment capital into struggling communities. They allow investors to defer or avoid taxes on capital gain if they put the profits into a fund and invest. 5,000 EV STATIONS OKd: Maryland’s utility companies on Monday won state approval to install a network of more than 5,000 electric vehicle charging stations — fewer than they had hoped for, but a step toward the state’s ambitious goal of 300,000 electric vehicles on the streets by 2025, Colin Campbell writes in the Sun. The five-year pilot program of residential, workplace and public charging stations would be paid for mostly by ratepayers. CAUCUS RAISES QUESTIONS ON KOPP: One of the legislature’s largest caucuses is raising questions about Treasurer Nancy Kopp and her last four years on the Board of Public Works, Bryan Sears of the Daily Record reports. The 56-member Legislative Black Caucus met Friday afternoon in an emergency closed-door session to discuss Kopp, according to sources familiar with the discussions. The meeting comes as the legislature prepares to appoint a treasurer for the next four years, whether it be the incumbent or another as yet unannounced candidate. BUSH, LEGGETT TO SPEAK AT HOGAN INAUGURATION: Former Florida Gov. Jeb Bush will travel to Annapolis to serve as the featured speaker at Gov. Larry Hogan’s inauguration Wednesday — a move that will put two favorites of anti-Trump Republicans on stage together. As so-called “Never Trump” Republicans search for a candidate to challenge the president in 2020, some have been urging Hogan to run. The governor has largely demurred, saying he’s focused on running the state, while not definitively ruling it out, reports Luke Broadwater for the Sun. Former Montgomery County Executive Ike Leggett, a Democrat whom Hogan cultivated as an ally during his first term, is also scheduled to speak in the afternoon ceremony on the State House’s lawn, writes Ovetta Wiggins in the Post. In a column for Maryland Matters, Josh Kurtz opines that Hogan and his team have unparalleled political antennae and an exquisite sense of symbolism, so the Bush and Leggett pairing announced Monday, while stunning in one way, also makes perfect sense. ELRICH HIRES NOTED PG OFFICIAL: An official who won environmental accolades for Prince George’s County has set his sights on the county’s neighbor and sometimes rival, drawn by the progressive vision of new Montgomery County Executive Marc Elrich, Rachel Chason writes in the Post. ELRICH SEEKS INFO-TECH FIRMS: Montgomery County Executive Marc Elrich is going on the road, aiming to attract more information-technology jobs, as part of efforts to boost the county’s business climate, Dan Schere of Bethesda Beat reports. The former county councilman, labeled by some as an anti-business candidate in last year’s race for county executive, believes the county is “lagging” when it comes to the information technology sector and that was a factor in Amazon’s decision to choose Crystal City, Va., for a new headquarters over locations in Montgomery County. PITTMAN ON ENDING IMMIGRATION PROGRAM: Citing a chilling effect on crime reporting and redundancy in other federal programs, Anne Arundel County Executive Steuart Pittman defended his decision to stop participating in a controversial immigration program Monday evening at the first of two town halls on the subject. Comments were not solely focused on the 287(g) program in question, but generally on immigration — “illegal” was the word used most often by the audience, Rachael Pacella of the Annapolis Capital reports.